I've noticed that allnurses uses icons to symbolize certain members' standings. I was thinking that maybe we needed some more icons to symbolize other members' standings..
An idea for an icon inspired by a post from the OldDude who said, "t wasn't until I became a nurse that I was able to embrace my sissieness and live life to the fullest... Now...where did I put that Barbie doll. " You've heard that old joke that goes, "If you looked up the the word (insert insulting word here) in the dictionary, do you what you'd find?" I told Grumpy RN, "As you are the epitome of a classification, Grumpy, I am suggesting we use your avatar as a icon: "
This idea for an icon was inspired by Daisy4RN who said, "every unit has a Clark. 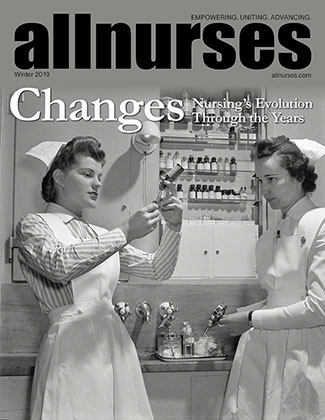 We had a whole hospital of Clarks that ran around the units following the nurses with clipboards making sure the nurses either washed their hands or sanitized." Many thanks Davey, I now feel validated, welcome and (dare I say it) loved. I won't say respected cos that is expecting too much. 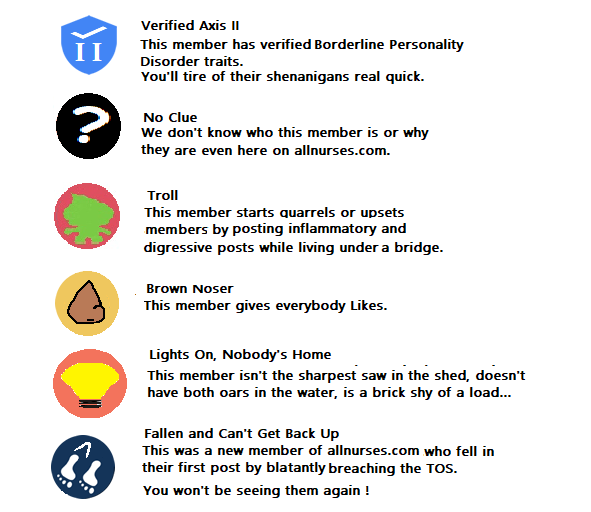 How do members get badges, and what do they all mean? Other than this post, I haven't seen any information about them. 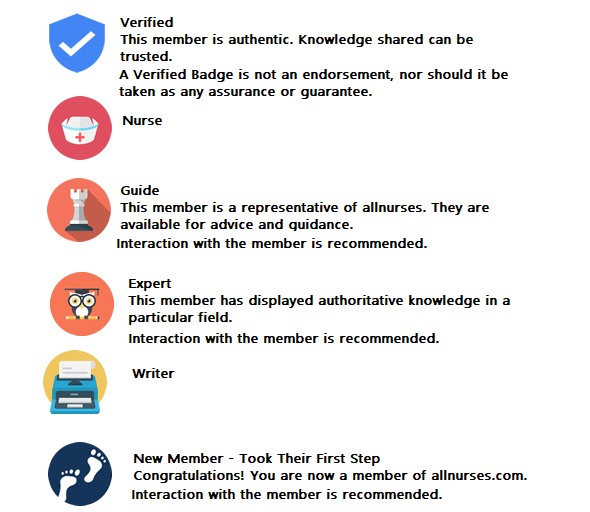 I'm a nurse - how could I get a nurse badge? What does 'verified' mean? Verified by who about what? Should I trust them with my life or my lunch bag? Never ever trust anyone with your lunch bag. Nurses are known to eat anything which doesn't eat them first. Hey y'all. This post hits it on the head for me. Specially thoughtful's comment. Short of the scuttlebutt I don't know if people will care what I say unless I'm "verified" or somethin', which bein new and all puts me in a chicken/egg pickle if I should even speak! I asked about this before the site changeover.... sirI was kind enough to answer about some of them, but I do wish there was a page somewhere that had a description of all the various badges. There are several others besides those in the graphic above. I’m guessing you have to be a paid member. Given my posting history you’d think I’d at least be verified and I am, in fact, a nurse.